- USA – Kempsville - Kempsville's early life as a bustling river port 250 years ago has only been hinted at in old city documents, its history traced by a paper trail of deeds and tax records. But last Friday, amid a road construction site and mounds of dirt, area archaeologists got their first glimpse of Colonial Kempsville. As excavators dug trenches to reroute storm drains and sewer pipes along Princess Anne Road, the heavy equipment dug up more than just dirt. "There was brick flying everywhere," said Tony Smith, an archaeologist who was at the site when the 18th century bricks were found. "When you get a bucketful of bricks, you kind of think, 'Hey, something's going on here.' " After temporarily stopping construction - the site is near the Oakmears Crescent and Princess Anne Road intersection - Smith determined that the bricks were from the foundations of two buildings that likely date back to Kempe's Landing, a once-bustling, 1750s Colonial river port. That expansive waterway - now a much smaller creek- was used to transport timber and tobacco up the Elizabeth River to Norfolk for export. The digging also turned up some 200 shards of German brown stoneware, which also dates to the mid-1700s, Smith said. It's the first discovery of artifacts from Kempe's Landing, he said. - ROYAUME UNI - Burrough on the Hill - A team of archaeologists has unearthed an Iron Age skeleton during excavations in Leicestershire. Dr Jermey Taylor, who has been examining the bones at the University of Leicester, said they were providing a wealth of information about how ancient people lived. He believes the remains, found at Burrough on the Hill, could have belonged to an important young man who lived 200 years before the Romans arrived in Britain. Dr Taylor added it was unsual from them to come across an ancient body buried in the county. - NOUVELLE ZELANDE – Kaikoura - A historic burial site was uncovered at South Bay in Kaikoura late last week. Earthworks at a residential building site on Thursday uncovered the remains of two people. A cultural monitor from Runanga o Kaikoura was called to the site on Kaka Rd, along with an archeologist. It is believed one of the bodies uncovered may be that of a person of significance, following the discovery of jewellery, hand tools and ochre. The remains have been removed from the site and will be analysed by archeologist Michael Trotter before he writes a report that will go to Runanga o Kaikoura, the Historic Places Trust and other interested parties. The discovery will also be registered with the Department of Culture and Heritage. - USA – Civil War - The Civil War -- already considered the deadliest conflict in American history -- in fact took a toll far more severe than previously estimated. That's what a new analysis of census data by Binghamton University historian J. David Hacker reveals. Hacker says the war's dead numbered about 750,000, an estimate that's 20 percent higher than the commonly cited figure of 620,000. His findings will be published in December in the journal Civil War History. - BULGARIE – Svichtov - Un trésor remontant au 2e millénaire avant notre ère a été découvert par un chômeur sous un arbre à Svichtov (nord de Bulgarie), a annoncé jeudi le musée archéologique régional. Deux haches en bronze, sept bijoux en or et six pièces en or qui servaient de parures de vêtement constituent ce trésor, datant de l'âge du bronze et d'une valeur estimée à 1,5 million d'euros. - INDE – Hyderabad - A copper coin belonging to the East Indian Company period was brought to the department of Archaeology and Museums on Thursday. The obverse of the coin has Anna 1818 embossed on it and the reverse side of the coin has images of Sri Rama, Sita and Lakshmana. Prof P Chenna Reddy, director, department of Archaeology and Museums said the coin is known as Ramatanka. The coin was reported to have been issued during the Sriramanavami celebrations by the East India Company in Srikakulam. - ROYAUME UNI – Kilwinning - Over the past five weeks the volunteers excavated 13 trenches around the Abbey and a series of test-pits in the town. They have also undertaken architectural surveys to locate reused sculpted stone from the Abbey. Archaeologist Tom Rees said: “The trenches within the Abbey have shed light on the complex and changing character of the east range of the Cloisters with its Chapter House and Dormitory. Within the South Transept the base of an altar and the east wall of a chapel have been located while in the West Transept the transformation of the Nave into the 1st Reformed Church has been evidenced. 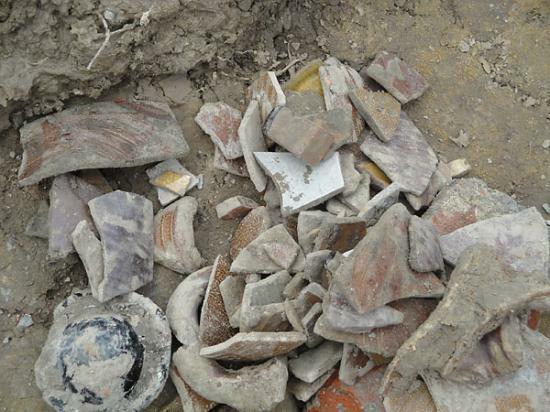 “To the west of the Abbey, on the Abbey Green, trenches have exposed the foundations of 18th century houses and medieval pits.” The army of volunteers have found medieval pottery, metalwork, architectural fragments and inscribed slates. But the highlight of the artefacts uncovered was a Neolithic leaf-shaped arrowhead dating from 3500BC. - KOWAIT – H3 - Rob Carter's interest in pearls began almost a decade ago, during excavations by the Kuwaiti-British Archaeological Expedition of H3, a fifth- and sixth-millennium site at the north end of Kuwait Bay. Starting in 1998, over the next five years the expedition unearthed a great deal, including pottery, tools, bitumen and even a ceramic model of a reed boat, which not only painted an intriguing picture of the complex trading networks that linked the neolithic world of the Gulf, but also provided the first evidence that the horizon-broadening technology of the sail was known in the region as early as the sixth millennium BC. But Carter, one of the expedition's field directors and an archaeologist with the Institute of Archaeology at University College London, was taken by one of its smallest finds - a pierced, time-tarnished pearl, barely 4mm across. A few years earlier, another lone pearl from a later period had been found during the excavation of a neolithic graveyard in Sharjah, but the H3 find was the earliest artefactual evidence of pearling in the Middle East. By chance, that same year another pearl was unearthed by archaeologists excavating a tomb in Umm al Qaiwain. - INDE – Archaeology - Archaeology in India has progressively changed from antiquarian pursuit to rigorous science. Leading this transformation has been the Archaeological Survey of India. Since its establishment in 1861, it has been ‘digging and discovering’ precious historical sites, and ‘deciphering and describing’ thousands of important inscriptions. The 150th anniversary is an occasion for the nation to acknowledge the ASI’s commendable track record and reflect on its future. Alexander Cunningham’s 1861 memorandum to Lord Canning, which impressed on the colonial power “the supreme need” to undertake a systematic survey of monuments in India, led to the appointment of the first Archaeological Surveyor. Ten years later, the ASI became a distinct department, with a monthly budget of Rs.54,000. Since then, it has taken up important excavations at sites such as Kusinagara, which provided an archaeological basis for Buddhist history. It recovered the famous Lion Capital at Sarnath, which has become a part of the national emblem. It unearthed key evidence at the urn burial site at Adichchanallur, which spotlighted the unique features of the Iron Age in South India. The high point in the ASI’s history was the 1921 discovery of Indus Valley sites at Harappa (by Daya Ram Sahni) and at Mohenjodaro (by R.D. Banerji). While epigraphy, excavation, and setting up site museums were part of ASI activities from the start, the periodic conservation of monuments and sites was taken up only from the 1940s. Here too, much of the work has been first-rate, with the magnificent preservation of the millennium-old Brihadisvara temple at Thanjavur standing out as an example. The ASI has shared its expertise with other countries and done significant work at Bamiyan and Angkor Vat. On the flip side, it has been able to protect only 3,676 historic sites, leaving an estimated 700,000 heritage structures unattended.